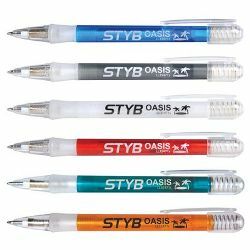 Plastic transparent ABS ballpoint pen with thermoplastic elastometric grip. Standard x-20 refill with 1mm tungsten carbide ball. Black ink refill. ITEM SIZE(MM) 135L x 9D. PRINT AREA(MM) Barrel - 65L x 6H, Clip - 30L x 6H. COLOURS Clear, Transparent Red, Transparent Charcoal, Transparent Blue, Transparent Green, Transparent Orange.